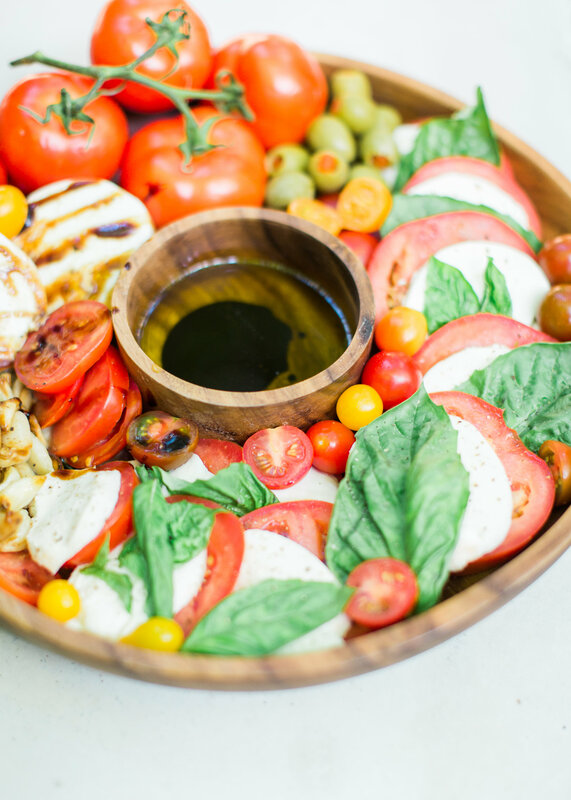 How to Make a Caprese Salad Platter With Wow Factor | Glitter, Inc. 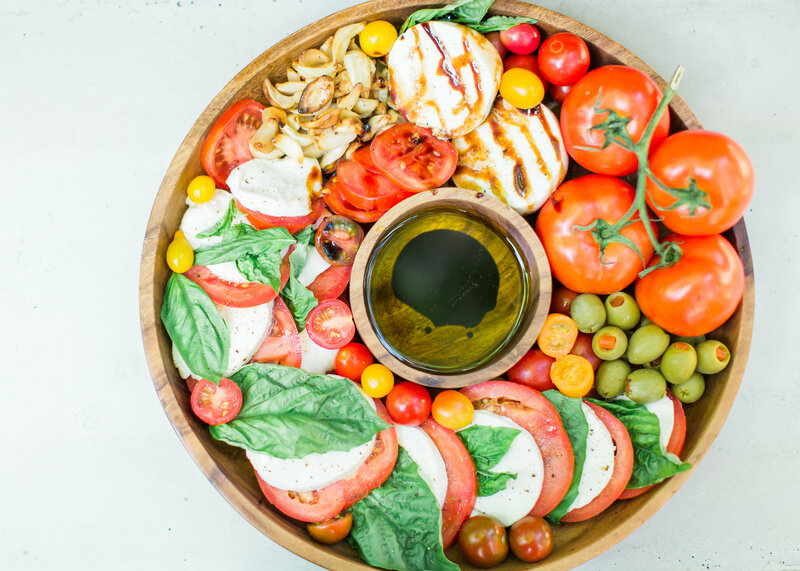 Tomatoes, fresh mozzarella, and basil drizzled with balsamic vinegar, or a sweet balsamic reduction, and olive oil; a caprese salad platter is so easy to make, looks beautiful and impressive (hello, wow factor! ), and the magical combination of flavors is totally delicious. 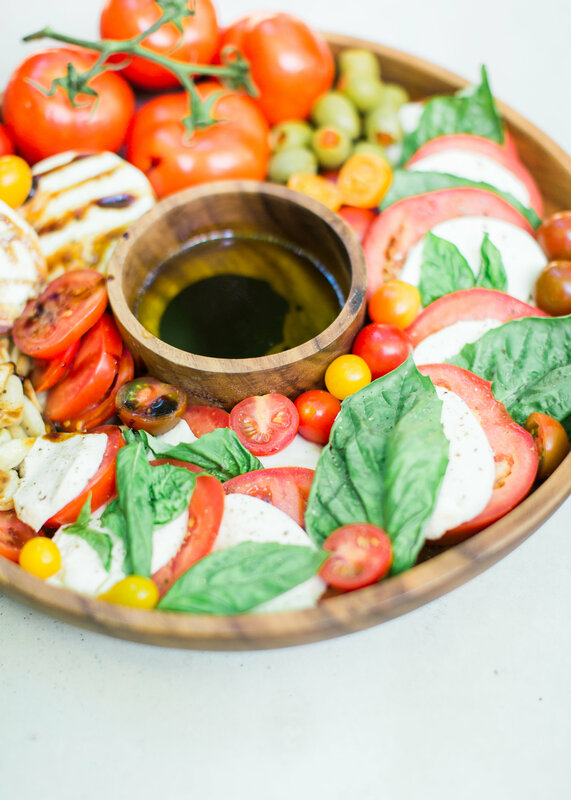 One of my go-to dishes for parties and events is the caprese salad platter. A traditional Italian caprese salad, or Insalata caprese (literally, the salad from Capri), is composed of fresh tomato, fresh mozarella, fresh basil leaves, a little oil, balsamic vinegar, salt and pepper. It’s so simple, and OH SO GOOD. The combination is magical. There’s something about the delicate and rich flavors, textures, and freshness, that all combines to make one banging good salad. Growing up, my mom always made caprese salad for parties and big Italian dinners, and as a tomato lover, I’ve always been obsessed. Seriously, I LOVE caprese salad. Over the years, I’ve learned to make a pretty epic caprese salad. Because it’s not something people regularly eat, guests are always really wow-ed by a big ‘ol caprese salad platter. And really, this one’s a crowd-pleaser. Everyone likes fresh mozarella … because it’s delicious. 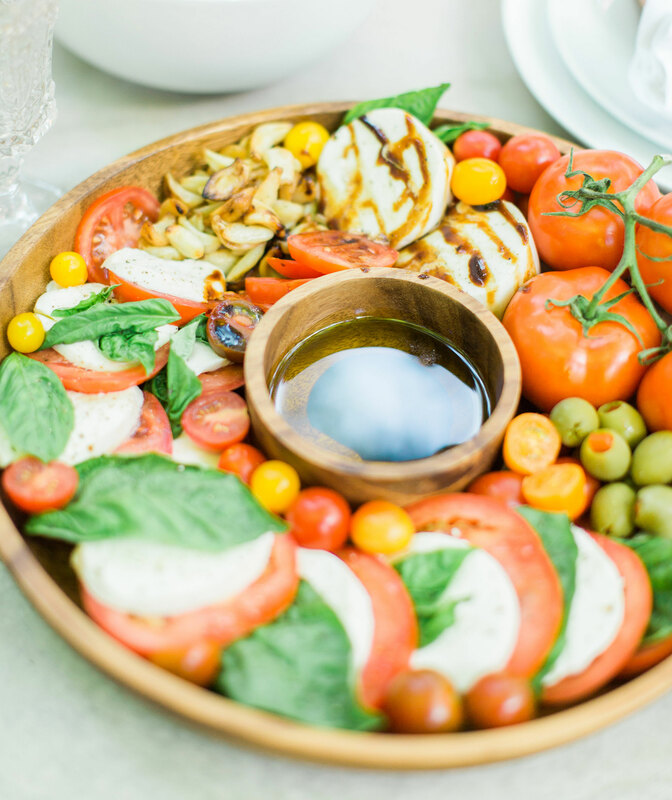 The secret, though, its that a caprese salad is unbelievably simple to put together; no cooking required – making it the perfect dish for parties. Just stack up your mozarella, tomatoes, and basil leaves, and sprinkle with oil, vinegar, salt, and pepper, and voilà! By the way, if you really want to add a yummy twist, without any exra work, most grocery stores sell prepared balsamic reductions. Using a balsamic reduction, rather than balsamic vinegar, will add a sweetness to your whole dish that pairs SO well with the olive oil, salt and pepper. If I’m really feeling festive, I’ll add in things like olives, heirloom tomatoes, roasted red peppers, roasted garlic, grilled asparagus, chunks of fresh parmesan, etc. 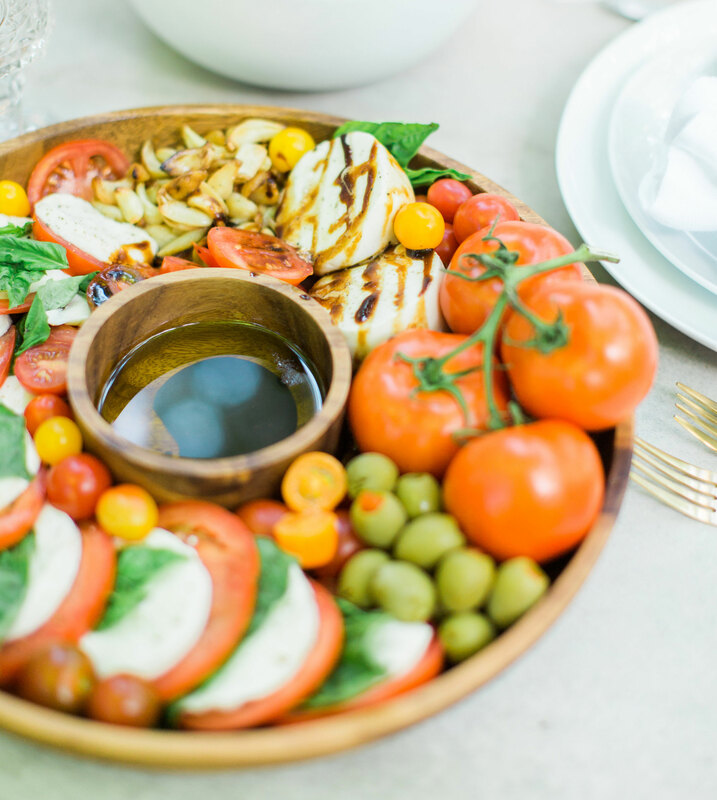 Just writing this post is making me crave a caprese salad all over again! optional: olives, peeled roasted red peppers, roasted garlic, grilled asparagus, etc. Arrange alternate slices of tomato and mozzarella cheese slices on a large, shallow serving platter. If you're using mozarella balls, get creative, and arrange in whatever pretty way you like! Add in any optional ingredients like olives, peeled roasted red peppers, roasted garlic, grilled asparagus, etc. Sprinkle with salt and black pepper, spread fresh basil leaves over the salad, and drizzle with olive oil and the balsamic reduction. Serve immediately. Serve your caprese salad platter with crusty bread … or a big fork. 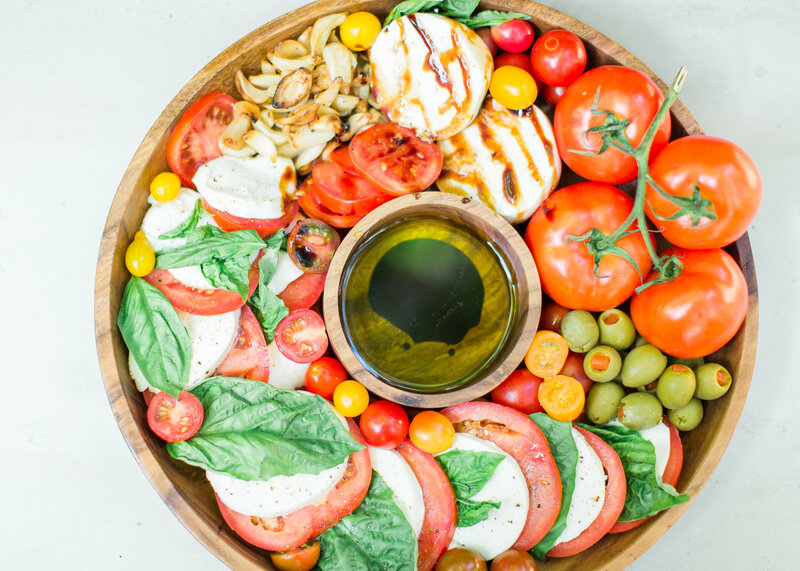 LOVE THIS CAPRESE SALAD PLATTER WITH WOW FACTOR? HEAD TO OUR RECIPE PAGE TO CHECK OUT WHAT ELSE WE’RE WHIPPING UP IN THE KITCHEN! Photos by Annie Watts Photography for Glitter, Inc.